with The EU’s idiotic and self serving jingo and the unsustainable claims that a claimed rise in global temperature, which can not be proven and is at best miniscule and no more than a natural cycle, are all the fault of mankind – Clearly ‘Warmist’ bunkum. We now see our utterly irresponsible politicians totally failing to provide a viable energy policy with more and more of our energy needs being supplied by French Nuclear reactors – Why are we not planning, building and utilising our own utilities – We NEED well managed, well designed nuclear power stations or we risk not just sitting in the dark, not just having a foreign power control us by the switch off of supply, not just intermittent unscheduled power outs but our infrastructure collapsing due to lack of energy! Don’t forget that your central heating and your hospitals and hot water may well be oil or gas produced but without electricity the pumping systems don’t work so you would have no heat, no hot water and of course no freezers or fridges – not just for YOUR food but for the 100s of huge distribution depots on which we are all dependent! Let us also note that the entire g;obal warmist scare is a monstrous unproven theory produced by mostrly state funded scientists – the very state which wishes not only to control us but to exploit us, having lost sight of the fact that they are OUR servants and not we theirs. The entire energy scam of renewables such as Wind Power is an economic non statrter requiring massive subsidies yet failing to deliver any meaningful service, input and results relative to both the subsidies and the environmental damage! Little wonder Scotland has a cable laid the length of the United Kingdoms to deliver French generated nuclear energy electricity! You may remember King Cnut who, to silence the fools and sycophants in his Court, ordered his throne placed at the low tide line and sitting in it proved he could NOT order the tides to turn back – Strangely our political elite in their stupidity have failed to learn the lessons of history and we find them passing Actsd of Parliament to please their masters in Brussels to ‘demand Climate Change’! Again and again it has been pointed out that wind power via giant wind turbines is not just a non starter but catastrophic in environmental AND visual terms. IF one is foolish enougjh to buy into the ‘carbon footprint’ scam then consider howmany years of maximum output of these turbines is required to repay the ‘carbon footprint’ of the infra structure of roads etc. to service them, the massive concrete blocks on which many stand and the inordinate amount of copper wire used in making their windings for the turbine, let alone joining up all these disparate and largely grossly inefficient eye sores. The shambles of our national energy policy is the subject of Booker’s column this week. This is the one that has our government wholly focused on the belief that we can somehow keep our lights on by building tens of thousands more wind turbines within eight years. We were, of course, not supposed to notice that, at one point last week, Britain’s 3,500 turbines were contributing 12 megawatts (MW) to the 38,000MW of electricity we were using. (The Neta website, which carries official electricity statistics, registered this as “0.0 percent”). And, although the utter fatuity of the “dash for wind” is well known now, it is some ten years since Booker first pointed out craziness of it all. It was pure wishful thinking then and is even more obviously so now, when the Government in its latest energy statement talks of providing, on average, 12,300MW of power from “renewables” by 2020. What can’t be emphasised enough is that this is utterly delusional. 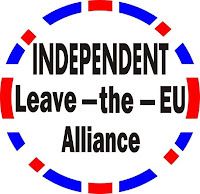 We have a government which, as a matter of policy, is declaring that cannot be done. There is no way it could hope to build more than a fraction of the 30,000 turbines required to meet that insane target. And then, as the windless days last week showed, we would also have to build dozens of gas-fired power stations just to provide back-up for all the times when the wind is not blowing at the right speed. But, says Booker, as more and more informed observers have been pointing out, the ministers and officials of the Department of Energy and Climate Change (DECC) seem to live in a bubble of unreality, without any practical grasp of how electricity is made, impervious to rational argument and driven by an obsession that can only end in our computer-dependent economy grinding to a halt. The latest attempt to get them to face reality is by Prof Gordon Hughes, a former senior adviser on energy to the World Bank, now a professor of economics at Edinburgh, who recently gave evidence to the Commons committee on energy and climate change. His most shocking finding is that the pursuit of our Climate Change Act target – to reduce Britain’s CO2 emissions by 80 percent by 2050 – would cost us all £124 billion by 2020, or £5,000 for every household in the land: not just to build tens of thousands of absurdly subsidised wind turbines, but also for the open-cycle gas-fired power stations needed to provide back-up. Yet, to guarantee the same amount of power from combined-cycle gas-fired plants would cost £13 billion, barely a tenth as much. Furthermore, as Prof Hughes explains, ramping the back-up gas plants up and down would mean running them very inefficiently, and give off so much CO2 that we could end up increasing our overall emissions rather than reducing them. And who is expected to build them or pay for them? Now, though, for the “killer”. The likelihood that any of this will be understood by those in charge of our national policy can be measured by the fact that the chairman of that Commons committee is Tim Yeo, whose business interests show that last year he earned, on top of his MP’s wages, more than £100,000 by working – at up to £800 an hour – for firms which make money out of renewables. When Peter Lilley MP raised Prof Hughes’s figures in the Commons, he was contemptuously put down by the DECC minister Charles Hendry, saying that he did not agree with Prof Hughes (on grounds which showed he hadn’t understood the points at issue at all) – and, he added, “neither does the Committee on Climate Change”. The new chairman of this committee, set up under the Climate Change Act, is Lord Deben (formerly John Gummer), whose various lucrative activities relating to the environment include his chairmanship of Forewind, an international consortium planning the world’s largest offshore wind farm, with thousands of turbines, on the Dogger Bank. Thus, the promoters of the wind industry have managed to occupy all the commanding heights of our energy policy, and the only way it might conceivably be brought back into any contact with reality would be through a massive and well-informed counter-attack by a large number of those elected to represent us in Parliament. 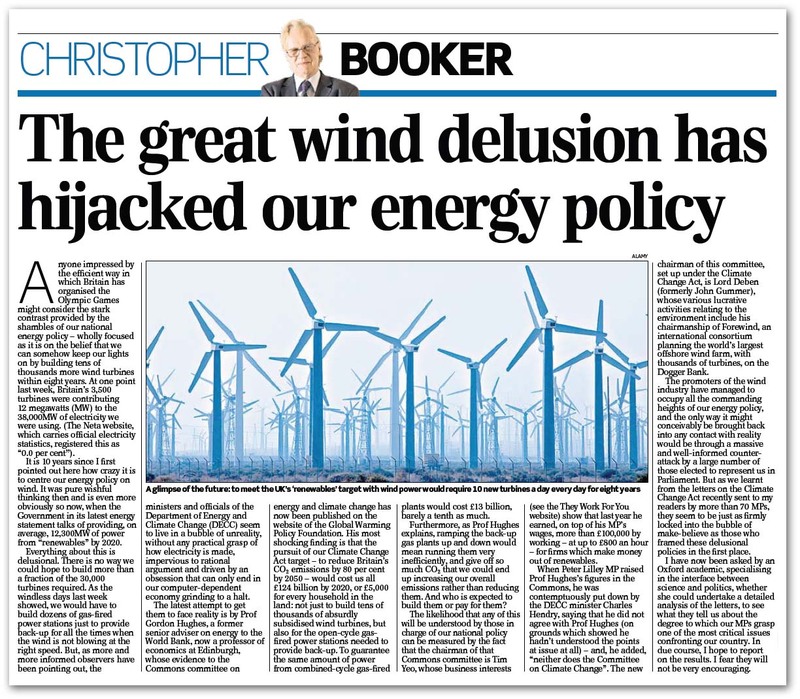 But as we learn from the letters on the Climate Change Act recently sent to Booker by his readers by more than 70 MPs, they seem to be just as firmly locked into the bubble of make-believe as those who framed these delusional policies in the first place. Interestingly, Booker has now been asked by an Oxford academic, specialising in the interface between science and politics, whether she could undertake a detailed analysis of these letters, to see what they tell us about the degree to which our MPs grasp one of the most critical issues confronting our country. In due course, Booker hopes to report on the results but, already, we fear they will not be very encouraging. We already know that parliament has completely failed to do its job here, making this one of the reasons why we can no longer tryst MPs. If they can’t be trusted on this crazy issue, how they be trusted on anything else? Previous Previous post: Is red Ken (Livingstone) to blame? Next Next post: Are French Bankers aiming to cause a British Banking Crisis?